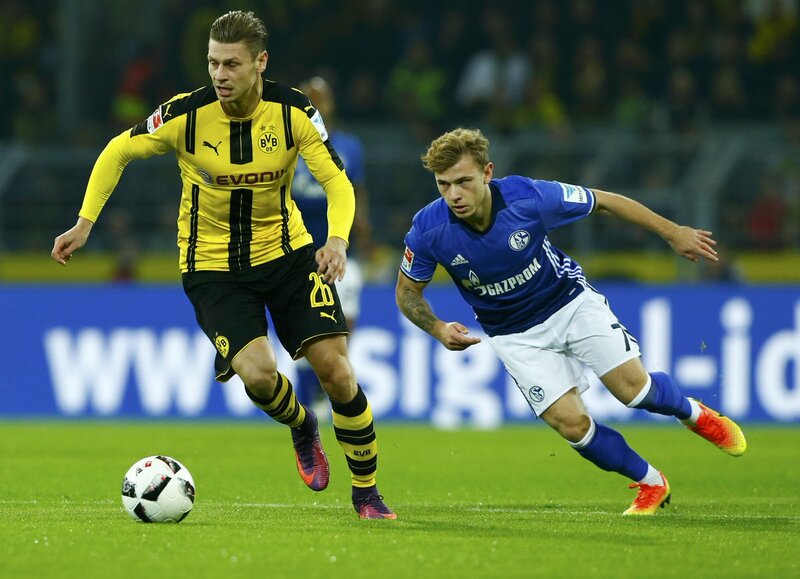 Schalke and Borussia Dortmund played out a tense draw in the Revierderby, as Schalke continued their upturn in form with a commendable effort at the Signal Iduna Park. With the iconic Dortmund faithful creating groundbreaking levels of noise, ex-Chelsea striker Franco Di Santo threatened to spoil the party in the Gelbe Wand with a run through the middle to infiltrate the high line played by the hosts' defence. The Argentine could not pick out the right finish though, as as Dortmund cleared eventually. Schalke's intense pressure cooled off after the opening exchanges, as Dortmund were able to take control of the game with plenty of possession, however their progression forward seemed to be stagnant in the face of the blue counter attacking machine. At any given point, Dortmund appeared to be on the verge of being sliced open by the ferocious counter attack, conducted by the creativity and precision of Meyer and Bentaleb. As a quiet first half drew to a close, it was clear that the visitors had set up for a defensive masterclass to halt Aubameyang and Kagawa, with Di Santo ready to strike at the other ened on the counter. The game restarted and Dortmund were soon appealing for a penalty, and rightly so. Ousmane Dembele's clipped cross appeared to strike Howedes on the hand, but referee Felix Brych waved away the claims of 80,000 inside the roaring stadium. The game momentarily sprung into life, as Sead Kolasinac's drilled effort stung the palms of Burki, before Dortmund replied with an even closer attempt, Dembele rattled the post from Pulisic's flick on. 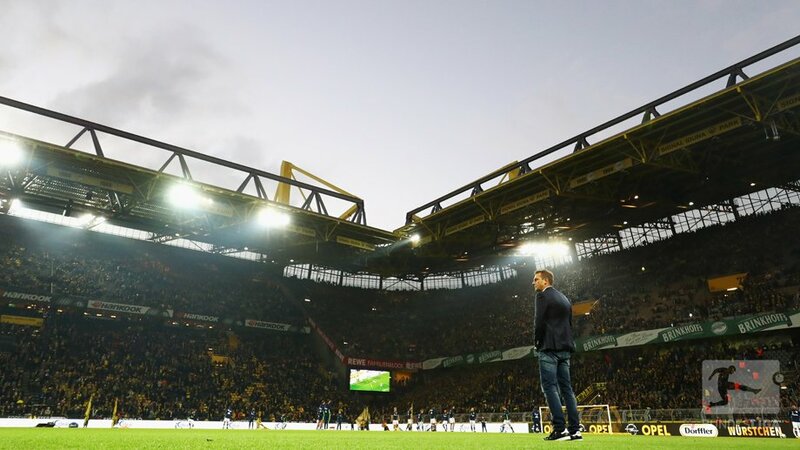 An opening goal looked to be on the horizon as Dortmund began to cause problems frequently, as the presence of Breel Embolo was missed for Schalke with a lack of potency in the visiting attack. Mario Gotze threatened to break the deadlock in the 73rd minute, as a fluid move from Die Schwarzgelben saw the playmaker ghost inside the Schalke box, but his finish was beaten away by Fahrmann in the Schalke net. A fourth successive game without a win drew closer for Thomas Tuchel, as Schalke held firm with what was now a six-man defensive unit. Gotze slipped Aubameyang into space, but the Gabonese striker couldn't find the target from a tight angle as the clock began to wind down quicker, the rocking Signal Iduna Park still backing the hosts to find something in the closing moments. 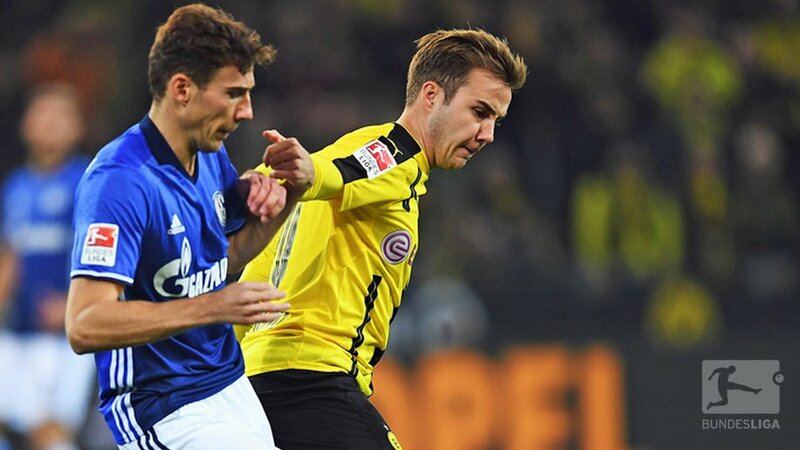 However, the black and yellows could not find the killer touch as Schalke's mission came to an end, a valuable point picked up against their fiercest rivals on an evening where it could have been a drubbing. Dortmund now sit fifth in the Bundesliga table, already eight points adrift of Bayern Munich at the summit, while Schalke improve to twelfth after a disastrous start to the campaign.